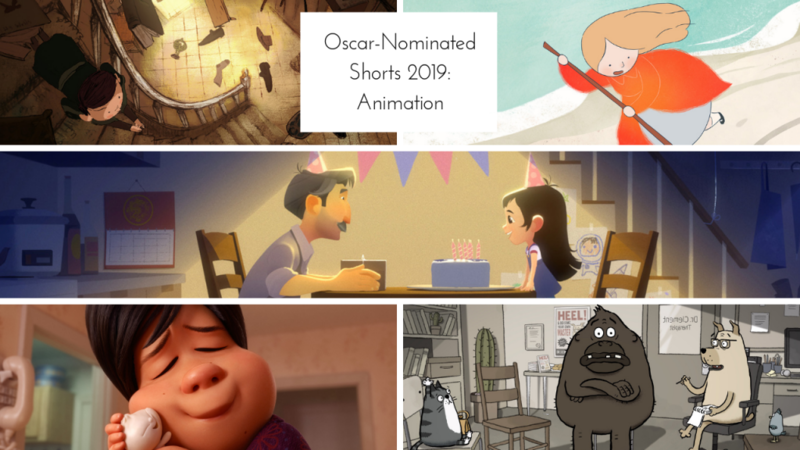 Aaron Neuwirth goes over the five animated short films nominated for Oscars for the 91st annual Academy Awards. 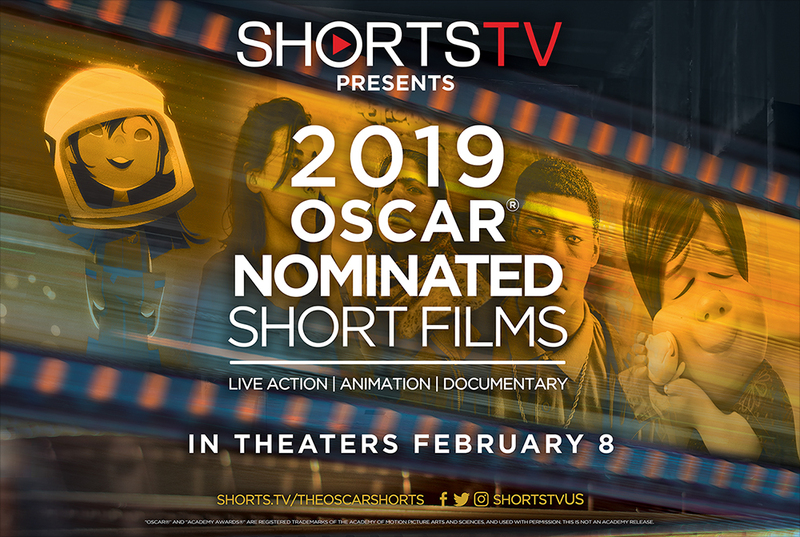 Whether or not the Academy deems the short films’ Oscars of being worthy to show on the main broadcast, I am happy to write about them, as they continue to be some of the most fascinating and ambitious films to arrive in a given year. Finding ways to successfully tell a story, develop characters, or connect on an emotional level in a small amount of time remains just as challenging as having two hours to do so. This sort of work often leads to the discovery of new talent, and regardless of what they move onto, these films will remain to show how even a smaller canvas can provide a compelling the cinematic experience. This post will focus on my reactions to the animated short films nominated for Oscars at this year’s 91st Academy Awards. 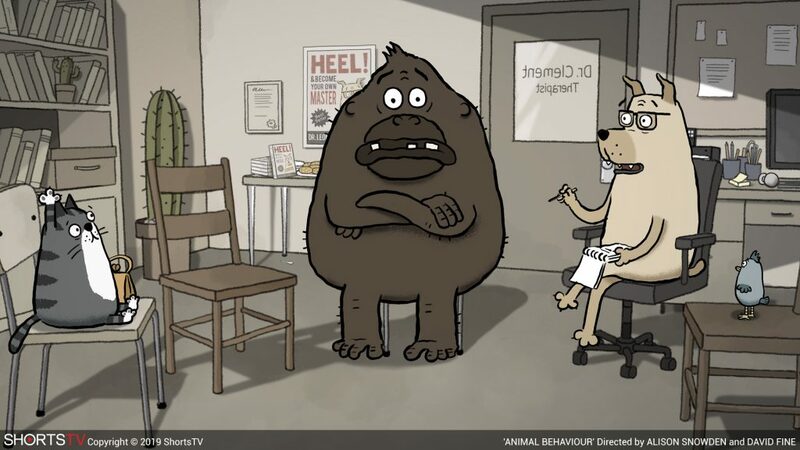 Watching these in alphabetical order, Animal Behaviour ended up standing out from the rest of the pack in terms of emotional resonance, as it plays the broadest with humor and its concept. Various animals sit in a group therapy session and deal with issues one could easily match to their species. The pig has impulse control around food; a leech is very needy; a gorilla has anger issues, etc. There’s nothing wrong with this, as the short is breezy enough, with some funny jokes to keep things moving along. The animation is good enough to convince someone this could be a weekly Adult Swim series. Slight, but a fun watch. Synopsis: Dealing with what comes naturally isn’t easy, especially for animals. In Animal Behaviour, five animals meet regularly to discuss their inner angst in a group therapy session led by Dr. Clement, a canine psychotherapist. Having served as the opening short for last summer’s Incredibles 2, Bao will easily be the animated short most are already familiar with. This story of a mother dealing with a son who is growing up and putting in more distance from her. It takes an imaginative approach to this concept, and there’s some visual fun in how we see this drama unfold. 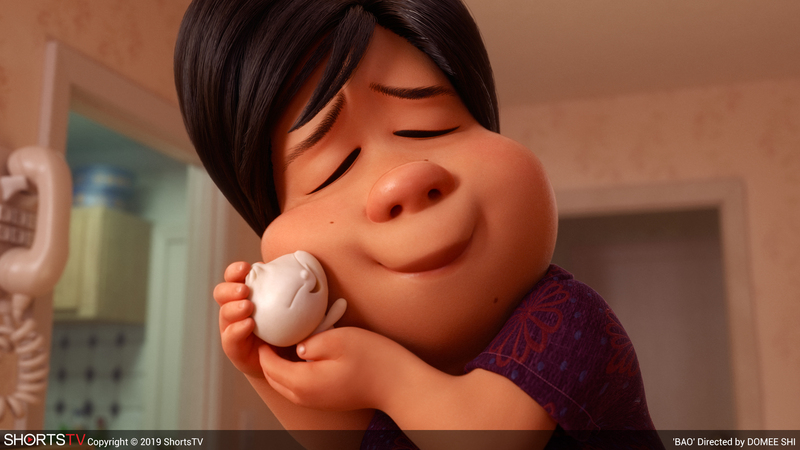 As a short produced by Pixar, the detail work is as striking as one would expect, complete with a depiction of dumplings and other Chinese foods that look great. The revelations that take place adds a nice amount of poignancy as well. It all works as a sweet and relatable story that is informed by the culture, without having it overshadow a universal concept. Watching this short unfold, it is interesting to think of how one develops the visual language to communicate fragmented thoughts through animation. 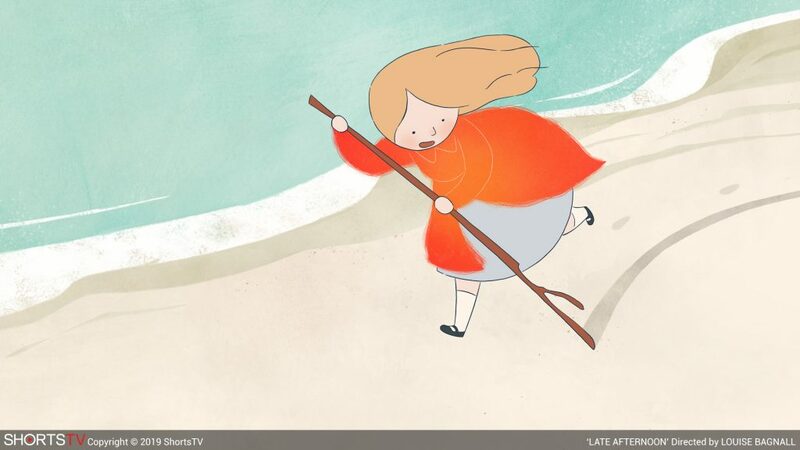 We view this story of an elderly woman, Emily (voiced by Fionnula Flanagan), reliving moments from her life and become invested based on how it holds onto a few constants. In only ten minutes, enough is communicated to provide a sense of history with Emily, allowing for a good amount of emotion to come through by the time this feature reaches its conclusion. Its effective storytelling, with an evocative style relying on abstract transitions to move us back and forth between the past and the present. The minimal design elements only further help to emphasize what works so well here. 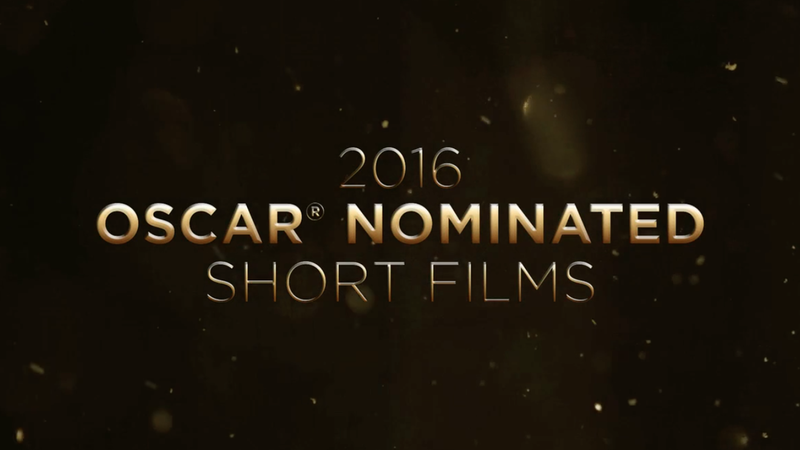 This short begins by showing me a kid who loves space, so I was already invested in what would be taking place. From there, we see both the work a young girl puts into her dream of becoming an astronaut, along with the support she continually received from her father. 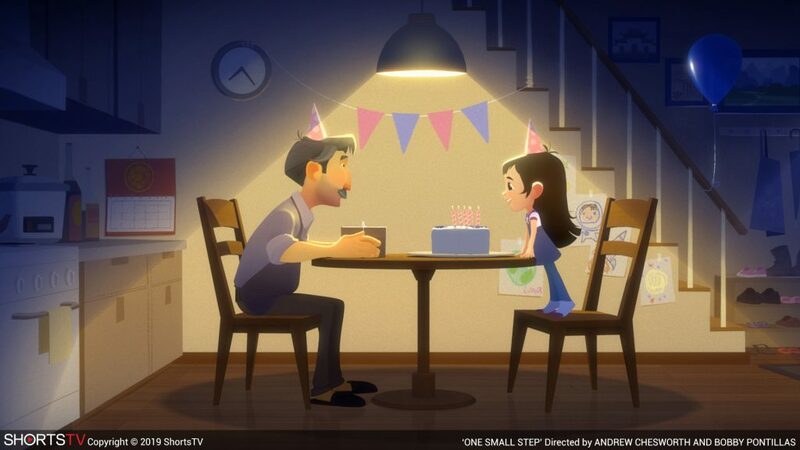 While not locked into one location, it is easy to see how the short uses a singular idea to communicate so much about the characters we are involved in and the journey taking place. There’s a lot to take away from that kind of visual storytelling, which is generally a significant part of these animated short stories. A lack of dialogue and an emphasis on music go a long way here, but there’s also the vibrant animation style. Even when the film dips into more dramatic territory, there’s plenty to like about the use of color and the way characters’ faces are given life. Seeing where it all goes allows for a familiar but satisfying ending as well. Usually one short sticks out for being more on the adult side. Animal Behaviour and Weekends come closest this year, and while the former is due to its broadness, Weekends oddness relates to its subject matter and surreal imagery. Telling the story of a young boy adjusting to his life, now that his parents have divorced means seeing his parents in a new light. Both parents deal with new relationships, and even without a lack of dialogue, one can infer a lot from the silent distance between them, as the boy is shuffled back and forth. 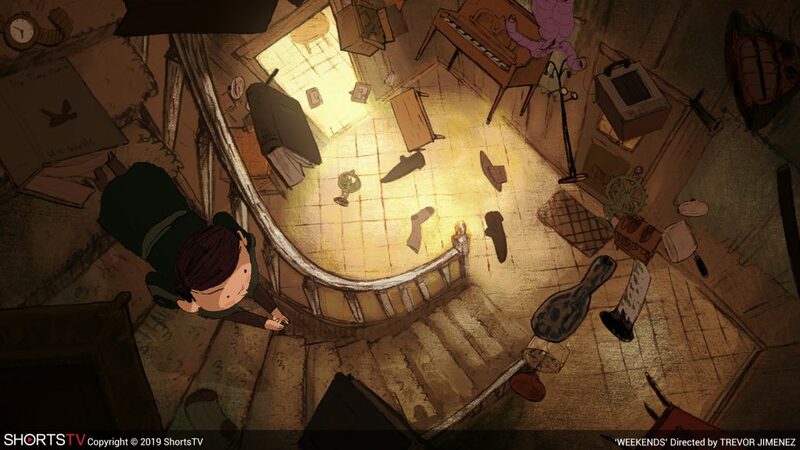 The animation stands out as far as being somewhat graphic in its presentation as far as weird dreams the boy has, and the use of various songs helps keep this film set in a particular era. This is maybe the darkest of the shorts presented, but it is nonetheless intriguing, let alone creatively structured and realized. Synopsis: Weekends is the story of a young boy shuffling between the homes of his recently divorced parents. Surreal dream-like moments mix with the domestic realities of a broken-up family in this hand-animated film set in 1980’s Toronto. 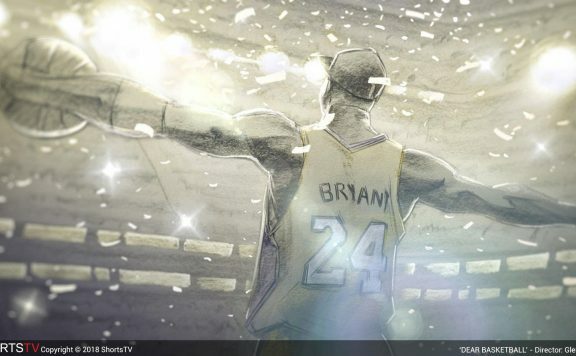 There is plenty to like about this set of animated short films. Some years tend to have a couple of easy favorites to root for; others make you wonder how they found that set of films to be the best of the best. I quite enjoyed each one of these shorts to varying degrees. 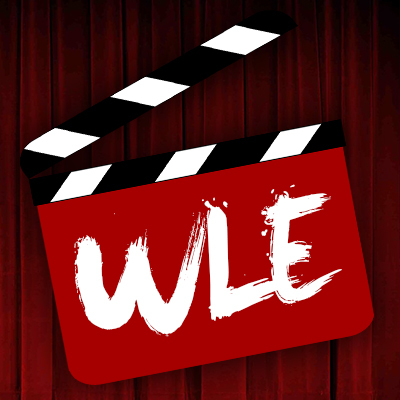 While I may not be the only voice heard in regards to their quality, I will speak up for this continuing to be an excellent opportunity for audiences to take in these unique little wonders, let alone a possible starting point to venture further down the short film rabbit hole.